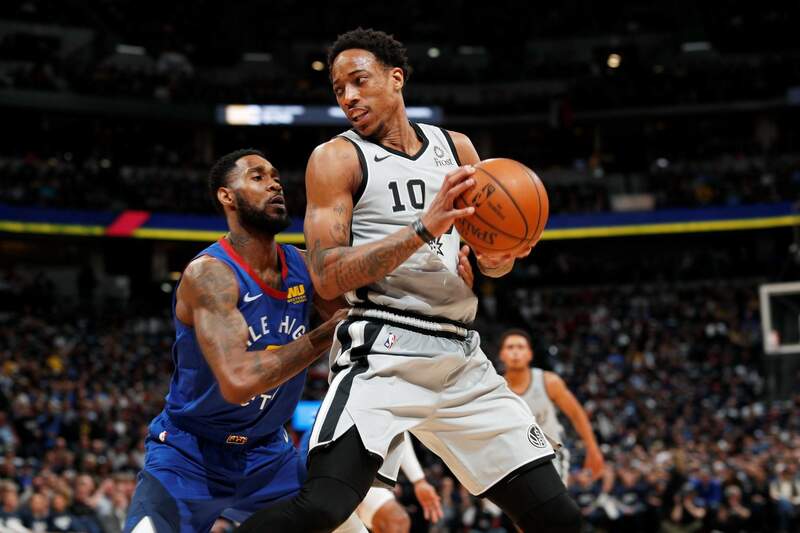 Denver Nuggets guard Will Barton, left, defends against San Antonio Spurs guard DeMar DeRozan during the first half of Game 1 of Saturday’s first-round playoff series in Denver. 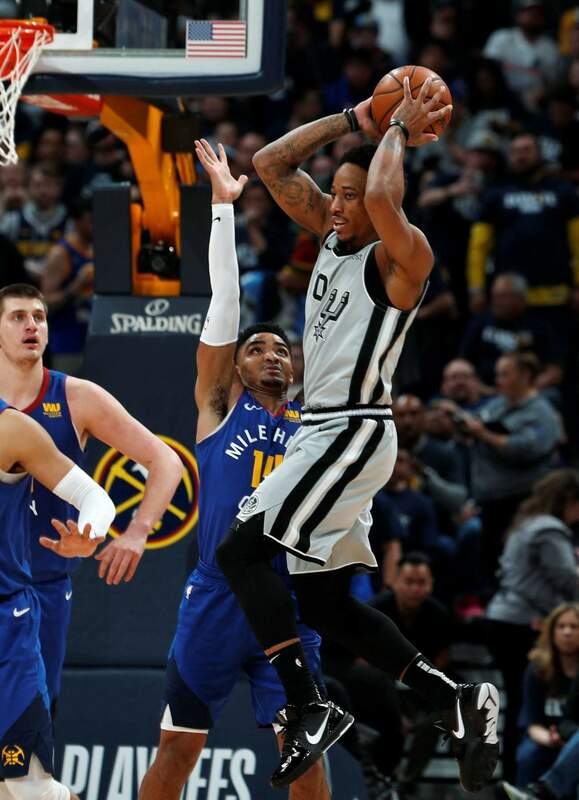 San Antonio Spurs guard DeMar DeRozan, front, holds the ball as Denver Nuggets guard Gary Harris defends during the second half of Game 1 of Saturday’s first-round playoff series Saturday in Denver. The Spurs won 101-96. DENVER – The thinking of DeMar DeRozan before joining San Antonio: Shoot. Gone are the days when he needs to erupt for 30 points to lift a team. The Spurs were 7-6 when he went for 30 or more. In contrast, they were 18-6 when he had eight or more assists. As for his 3-point shooting, he only hit seven — his last one on Dec. 26 against Denver – as he took 242 less attempts than in ‘17-18. So far, a good start for DeRozan in this version of the postseason. He played a big role in San Antonio’s win. Sure, with his shooting (6-of-17 for 18 points), and rebounding (12) but even more with his passing (six assists, including three in the fourth quarter). The preparation is a little different with the Spurs. Not better, not worse, just different. The Spurs have been to the postseason for 22 consecutive years and have captured five championship rings.